Siding is a protective shell for your home. Because the siding is the outermost layer of your home, it takes the brunt of storms in order to protect the rest of your home, as well as the friends, family, and belongings that you keep inside. Over time, siding can wear down and become weak as a result of being constantly bombarded by intense New England storms. 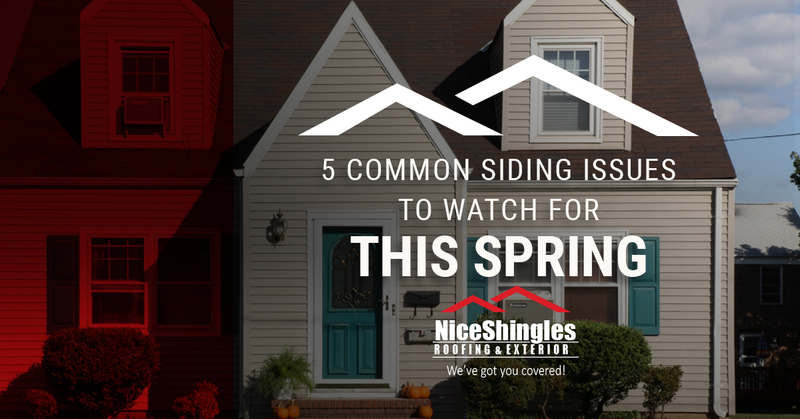 While a new installment of siding can last for up to 20 to 40 years, it is still important to check it every so often for damages and defects — and at Nice Shingles Roofing & Exteriors, we suggest you do so every spring. Below, our siding company has made a short list of the five most common siding issues and damages that you should be aware of when inspecting your home for damages. Warping and buckling are some of the most obvious damages that you might see in your home’s siding — in fact, you usually don’t have to look too hard for it and will likely notice it before you inspect your home. Warping and buckling occur as a result of the siding expanding and contracting due to temperature fluctuations and moisture in the air. Wood and vinyl siding respond a little differently to these fluctuations, but both materials will visibly warp or twist while still fastened to your home. If your siding seems to be warped, we suggest that you get in touch with us so that one of our siding contractors can come to your home and inspect the damages. Fading is one of the more harmless defects that are common in siding — unless you have a homeowners’ association, that is. Fading, much like warping and buckling, is caused by exposure to the elements. Over time, the ultraviolet rays from the sun and storm wear and tear will cause discoloration to the siding on your home. While fading is technically a damage, the structural integrity of the siding will remain the same — meaning that the extent of the damage is purely aesthetic. Fading does, however, lead to different issues is it is not addressed. If the siding is not painted or treated, fading can lead to cracking. Cracking is an extremely common damage here in the New England area — and it can be caused by a number of different issues. One way that siding can become cracked is by physical damage. It is not uncommon in the Stroudsburg and Pocono’s areas for branches and other debris to fall during intense storms, and if the debris comes in contact with your home, it could result in your siding becoming cracked. Additionally, as we discussed above, cracking can also occur as a result of fading. Fading merely suggests that the siding has been exposed to the elements for a long period of time — and if the siding is not properly maintained, it might crack. If you notice cracks in your siding while inspecting it this spring, consider contacting us to get a siding repair quote. Moisture issues with siding usually stem from a faulty installation — as it is general protocol to install a waterproof barrier before the siding is hung. If moisture is trapped between the siding and your home and there is no waterproof barrier present your home and your siding could be at risk of rotting. If you notice moisture buildup on your siding, it is important to contact a siding contractor right away before the potential damages to your home become worse. Have you ever thought “where is that noise coming from?” only to inspect your home and find no potential hints of its origin? If you have, you might have loose siding. Siding can become loose from wear and tear, or even from improper installation. Regardless of why the siding is loose, it is important that you contact your local siding contractor to have the siding repaired before it becomes a larger issue. If you need your siding repaired, or even if you simply need your siding to be inspected, we urge you to contact us today. We will send an experienced siding contractor to your home right away! Let us help you protect your home today.